In case you aren’t hip and up to date with the booming tech scene, YCombinator and TechStars are the two best startup accelerator programs in the US. Together, since YCombinator’s first class in 2005 and TechStars’ in 2007, an accumulative 377 new tech companies have passed through their doors. These companies don’t just receive space, free food, and mentorship; earlier this year Yuri Milner, a Russian “Tycoon” whose already invested in Facebook, Twitter, and Spotify, announced that his fund, StartFund, and SV Angel would offer every new Y Combinator startup a $150,000 convertible note. TechStars has followed suit and in September announced that it raised a $24mm fund from the likes of Foundry Group, investors in MakerBot (see classmate Nick’s final project), and RRE Ventures, investors in companies like HowAboutWe and Betaworks, so that every new TechStar’s company receives a $100,000 convertible note upon acceptance into the program. This is tuppence though compared to the combined $759 million they have all raised over the past 6 years. So you’re thinking about applying? Well you aren’t alone. You might have gotten into Yale but YCombinator and TechStars take exclusivity to a whole new level. Yale just accepted 15.7% of early applicants to the class of 2016. YCombinator though has an acceptance rate of around 3%. TechStars’s first NYC class had a shockingly low 1.1% acceptance rate. Now how about that for exclusivity! 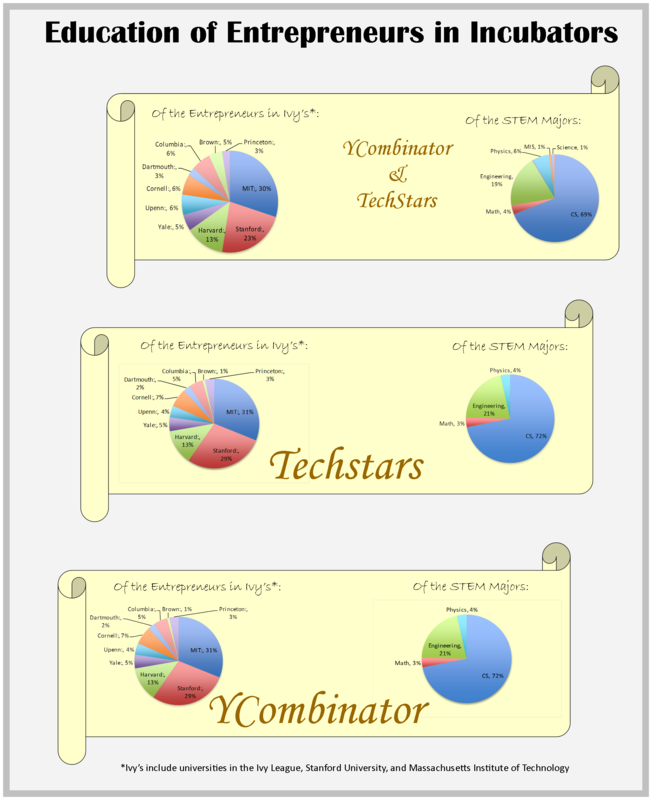 A lot of people have compared TechStars and YCombinator based on startups’ fundraising and exits. A post on TechCrunch last weekend did exactly that and stirred up a heated debate about the respective merits of each program among devoted alumni and fans. Funding though is a metric by which to measure success, rather than an important factor for success. So if YCombinator and TechStars are more exclusive than the Ivies, just who are these A player founders forming the “world class teams” of the future? To answer this we dug up Linkedin profiles for 254 out of the 377 total companies from the past 6 years and documented founder’s college and major. In the process we also have empirically helped answer a long-time question plaguing many aspiring entrepreneurs: can you really be a non-technical co-founder? 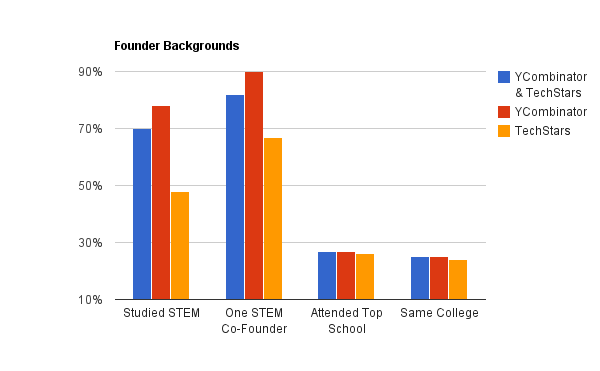 If you want to get into TechStars or YCombinator, and are a Freshman or Sophomore in college, you might want to jump of the cool-kid bandwagon and actually study STEM (Science, Technology, Engineering, Math). There is definitely little such thing as a non-technical team. The accelerators might tout that they are more exclusive than Yale, Harvard, MIT, Stanford etc but those graduates make up a non-insignificant portion of startup founders the accelerators accept. 25% of co-founders attended the same college – your college network is a powerful community to tap into when you want to find that second A player to start a venture. From an investor’s perspective all of this looks like great news: these incubators take an overwhelming majority of true tech people, with higher ed backgrounds, and shower them for 3 months with top-notch mentorship and a wealth of resources that help drastically lower the chance of failure. Oh, and there are clear runaway success stories like Heroku, and AirBnB and DropBox are in the pipeline. Investors have definitely taken note. In fact, so many have that the whole thing is turning into a feeding frenzy. The number of investors scrambling to participate in early stage rounds has ballooned. Each dot below is a specific company. 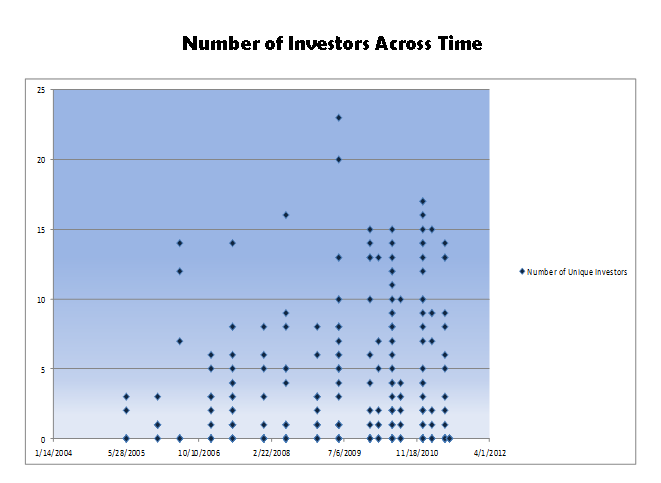 On the x-axis is when they attended the accelerator, and on the y-axis is the total number of investors throughout the lifetime of the company. Despite being much younger companies, recent accelerator grads have on average more investors even though they will have had the opportunity to raise fewer rounds. If you want to see the dataset we put together click here.